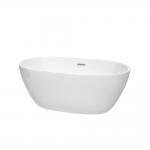 Warm, inviting soft curves beckon you to a new style of bathing. Deep, comfortable and truly blissful, the 32-inch wide Juno bathtub is built for the fully immersive experience you'll remember from your favorite spa. Pure, indulgent luxury with room to really enjoy your down time. Absolute heaven. Depth at drain: 17 in.